The thing is Bucharest showered us with beauty. We were there at the height of the leaf change and my breath was taken away everywhere I looked, and then something would happen that just made me want to go hole up back at the hotel. I tried my best to ask questions that got to the heart of why this was such a hard trip and at the end of the day the answer seems to be a complicated history that has led to a corrupt government. Everywhere we turned people were trying to scam tourists. Taxi drivers would not use the meter and demand a 500% price increase from the base fare posted on the window. The public transport machines had hand-written signs saying they were out of order forcing you to use a ticket window where the worker would claim not to have change or hope you didn’t notice the higher price he charged. Even at museums someone near the door, looking official, would sell you a ticket and then when you get to the entrance door you’d find out that wasn’t actually the ticket. We luckily didn’t get taken by any of these scams, but saw them all happen. It’s exhausting to try to navigate a city with young children when you’re constantly worried about these things and it really takes the enjoyment out of it. Sure, you can just ignorantly go on with the premise that you’ll get scammed but without worrying you can have a nicer trip. We spoke to several taxi drivers and several hotel employees about why this happens. The general consensus from those we spoke to was that the taxi rates and other fees are not enough to make a living off of. The government sets prices so low that most drivers cannot even afford gas for the trips they are making. To support this idea, I’ll say that almost every cab we got into operated on a nearly empty tank of gas. We even had one taxi driver stop for gas with us in the cab – with the meter running. We were staying at the Marriott, which was part of the problem. We were instantly and easily identified as American tourists. The Marriott however subcontracts with a taxi company to ensure that the meter is used anytime you leave the hotel by taxi. Further we were happy to have the comforts of the Marriott, including a pool, for our nearly week long stay while Jeff was at a conference. We popped into a few other hotels and found that, in general, they were one less star than advertised. The Marriott was our refuge on this trip. Things are completely and utterly disorganized in Romania. We found trees routinely in the middle of sidewalks such that you cannot pass them with a buggy. The hop-on-hop off bus that runs “year round” was not running due to weather, when we were there on one of the nicest weeks of the year. This was not stated on their voicemail or webpage. After waiting for the bus with a few other tourists I found a message on the company’s Facebook page saying they wouldn’t be operating. 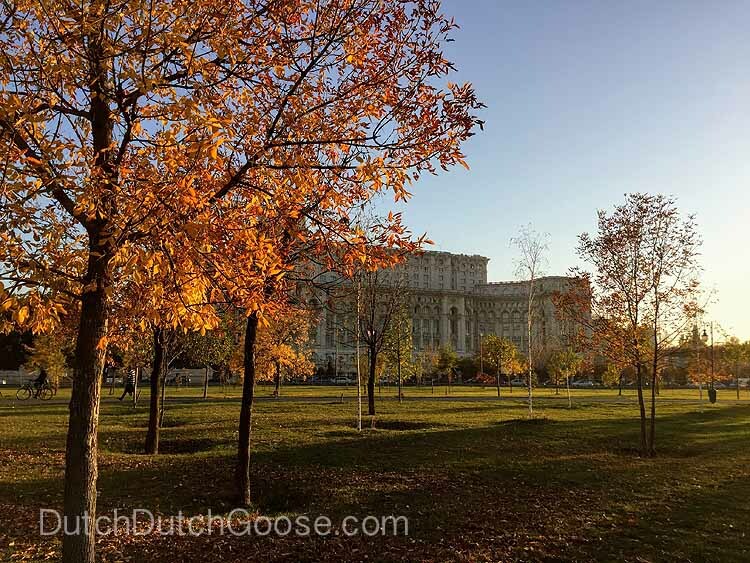 Now that I’ve listed my litany of reasons it was hard to really enjoy our trip to Romania I do want to tell you about a few little gems we found along the way. The boys and I took several forms of transportation and got lost a few times on our way to the village museum, but once we arrived it felt like an oasis. The National Village Museum of Romania sits in a lovely park on the edge of a lake. Tickets are purchased through a machine, which took the risk of being scammed out of the equation. The houses are all perfectly preserved and span the history of Romania. I suspect that the houses are supposed to be open, but they were not on the day of our visit. Honestly, the kids didn’t care and they ran around this lovely setting exploring the yards and trees. I had a chance to view the exteriors of the houses. There are several small playgrounds here as well so we stayed the whole day. There is a cafe serving lunch. There is sit-down service but we picked up a few snacks and ate on the playground. There was a random, abandoned, human-powered carousel at the park as well. It’s chained up so it can’t spin but the boys enjoyed seeing all the old horses and crawling around on it a bit. The village museum is in Herăstrău Park so we sort of wandered into this park by accident. It was perfect for exploring though. The wide paths made pushing the stroller easy and the boys loved running on the shaded paths. There were plenty of playgrounds to explore. The park is full of statues and busts. There is an open air theater, although I couldn’t figure out how to find events happening there. An adventure park offers four trails of varying difficulty. A two-hour ticket cost 35 lei for children. (This was not open when we were in the park.) There also appears to be seasonal boat trips that depart from the park. The main draw in the park for us was the leaf piles! My kids have been a lot of places but have never really seen changing leaves in bulk, something I grew up with. As soon as they saw the piles they needed to jump in them and throw the leaves up into the air. Our kids were covered in dirt but were happy as can be. The park is easily reached by metro (which was clean and convenient when not crowded) using the Aviatorilor metro station. This station is directly across from Bucharest’s Arc De Triumph. The Romanian Palace of Parliament is the second largest administration building in the world after the Pentagon. They offer tours but I didn’t dare to take one with the kids on my own. The building is so massive and the grounds are so poorly signed that visitors trying to find the tour entrance are often an hour late for their tour! Jeff’s conference was in the building, so he got to see quite a bit of the building. We however enjoyed the view of the building from the amazing playground across the street. This playground is massive and full of lovely families. I was able to chat with some of the moms while the kids played. They gave me advice like to keep my purse close and walk through parks whenever possible to keep the kids out of the road (I kid you not.) This playground would be top notch if it were cared for, but instead we found it covered in graffiti, despite the presence of people in the park to monitor these sorts of things. The littles obviously didn’t care about any of this though and thought the playground was amazing. The castle playground is truly large so I was glad to have the Trax GPS on our middle little who gets lost in play. I set the parameter on my phone for the playground and knew if he left the immediate area. The Carousel of Light bookstore is stunning. This 19th Century building was confiscated during Communist times and turned into a regular store. In 1990 the owners returned it to its glory and added a multipurpose space. There is an art gallery on one of the floors, while other floors provide plenty of space to grab a chair and read. We each spent some quiet time exploring and in the end left with a few activity books for the kids. We also checked out the cafe on the top floor and sampled some of the lemonade. Jeff found it all too sweet but mine was fruity and refreshing. We visited a bunch of these street pastry shops and it was about the only place we never got scammed. We found the bakers to be friendly and sweet with the kids. We honestly could not get enough of the treats coming out of these windows. I honestly don’t know what anything was called. Every time we passed a window we would just point at what looked good. It was always fresh, cheap and delicious. Overall, I can’t really reccomend a whole visit to Bucharest, but if you go I’m sure you will find some amazing things. I think you’re better off heading out to the country to enjoy the natural wonders and smaller towns.